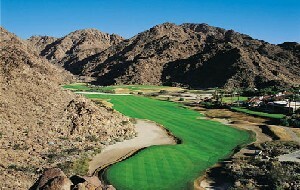 The Mountain Course at the LaQuinta is just one of more than 100 excellent Coachella Valley tracks. In the initial weeks of 2016 the good people of the Pacific Northwest are once again depressed by relentless precipitation from the region’s slate-gray skies. Across Minnesota and Wisconsin yet another snowstorm could be the final straw that sends stolid Lutherans overboard and into a bloody tribal war against Episcopalians, waged with shards of broken hot dish. Meanwhile, a stout El Nino is finally bringing rain and snow to Northern California and the Sierras. At this time of year, folks from upper North America are in dire need of Palm Springs and the entire Coachella Valley, where winter is warm, dry and seasonal affective disorder is but a distant memory. A once-sleepy city that was sweet enough to attract the likes of Frank Sinatra, Bob Hope and Dean Martin – – who could have chosen to lead the high life almost anywhere – – the venerable spot has much more going for it today than good weather. Indeed, there are roughly 120 great golf courses in the area, half public and half private, including the outstanding Troon-managed Classic Club the fabled Mountain Course at La Quinta, two fine courses at Indian Wells and the tournament-tested Stadium Course at PGA West, three of which I played during early December’s Media Golf Classic, one of several trips that turned Palm Springs into one of my favorite golf destinations. What’s more, from January through March, the valley hosts a party that runs non-stop for 12 weeks and beyond. It starts during the first week of the year with the Palm Springs International Film Festival, one of the largest in North America, attracting more than 135,000 moviegoers who watch old and new international features and documentaries. January is capped with the PGA Tour tournament now called the CareerBuilder Challenge, but more familiarly known as the iconic Bob Hope Classic. February brings Modernism Week, an 11-day festival that celebrates the midcentury modern design, architecture, art and culture that is woven into the fabric of the Valley. At the same time is the Cathedral City Hot Air Balloon Festival, colorful and spectacular. 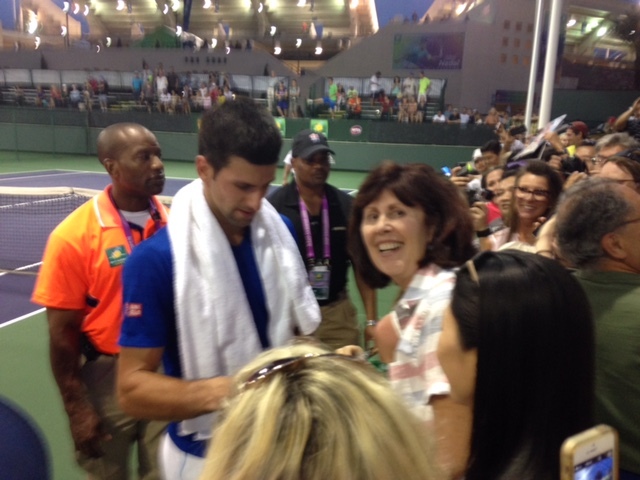 In March comes a seasonal high point, the BNP Paribas tennis tournament at the Indian Wells Tennis Garden, which for players and fans is arguably the most popular non-major stop on the tour. Running from March 7 to the 20th, this event always draws the world’s top-rated men and women. 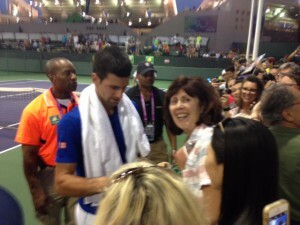 Practice sessions are among the most popular and well-attended attractions, in that fans are exceptionally close to the likes of Novak Djokovic, as demonstrated by the cell phone photo to the right, taken at last year’s tournament. Located about 110 miles east of Los Angeles, Palms Springs initially became a fashionable resort destination in the 1900s, particularly for “health tourists” with afflictions that subsided in dry heat. While it used to be largely deserted in the tepid summers, the city today has a permanent population of around 45,000. Other rapidly growing communities now sprawl to the south, including Desert Hot Springs, Palm Desert, Rancho Mirage, La Quinta, Indian Wells, Cathedral City and Indio. The southern reaches of the valley is where most new housing is found, including the Trilogy at the Polo Club development that you read about at this link. Old Palm Springs – – where Sinatra & Hope lived – – has perhaps the best climate, shaded in late summer afternoons by the San Jacinto Mountains, which in turn block cold winds during winter. It was the climate that initially attracted Hollywood movie stars to Palm Springs in the 1920s. Amenities soon followed. Over the years, wealthy winter fugitives funded innovative architects, who designed leading edge “mid-century” and “desert modern” homes, many of which still stand in the oldest section of town, and which is celebrated during Modernism Week. Yet another featured aspect of the region is ample fine dining. From barbecue at Babe’s in Rancho Mirage to brunch at the IW Club in Indian Wells, there are about eleventy zillion fine restaurants to choose from. I’ll recommend one that’s extra special – – Miro’s, on South Palm Canyon Drive. 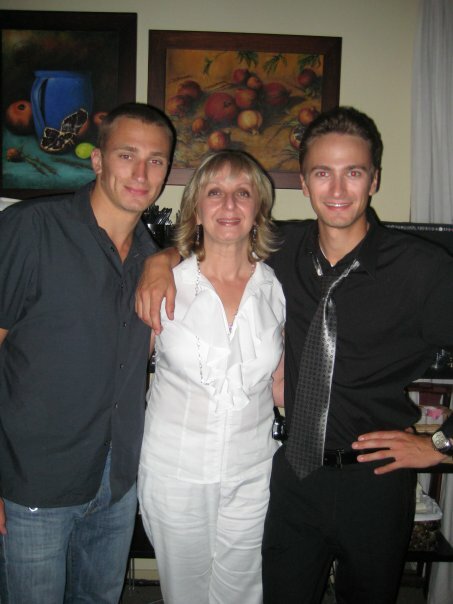 Cousin Mirela and her sons Miran (left) and Vanja, at Miro’s. Established in 1994 by Miro Terzic and his wife, Mirela – – shortly after they emigrated from the city of Mostar in the former Yugoslavia – – Miro’s is one of the distinct offerings in the Palm Springs culinary market, serving a blend of Slavic, Hungarian, Italian, Greek and German style cooking. Today, their sons Miran and Vanja also help with the operation. Appetizers include cabbage rolls, made from an old country family recipe, Moroccan lamb meatballs, Dalmatian shellfish and escargot baked in herbed butter, garlic, shallots and white wine. Miro’s Cioppino and Scallops Rockefeller are highlights of its fish and seafood line, while Budapest pork tenderloin Schnitzel, Beef Stroganoff, Viennese Pot Roast and Two Day Pork Osso Buco are typical hearty fare. Full disclosure: I am definitely biased, since Mirela is my wife’s cousin. A couple of years ago we actually visited Mirela’s home town in Bosnia, learned of her and the restaurant in Palm Springs, and last year went there for dinner. But if my word isn’t good enough, check out the four-and-a-half star rating on Yelp, where reviews are anything but biased.